There are many species of fish in the drum family, but red and black drum are the most commonly harvested in the U.S. Red drum is also known as redfish or spot tail bass. Red drum are also imported from other parts of North, Central and South America. 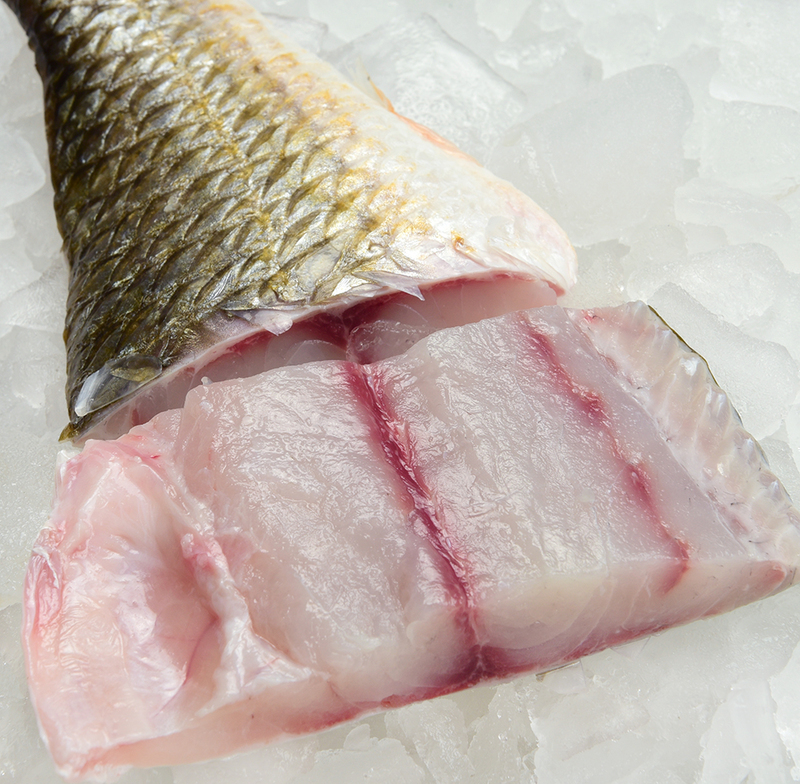 Drum have a firm texture and mild flavor, similar to snapper. Black drum has a slightly denser texture than red drum. Drum do carry parasites that are harmless when cooked to a temperature of 145 degrees F and drum should not be used as sashimi or in ceviche. Red drum are found along the western coast of North America from Massachusetts to northern Mexico. In most states red drum is classified as a gamefish and only recreational harvest is permitted. North Carolina is one of the few states that still allows commercial harvest and produces most of the commercially available wild red drum. There is no directed fishery, but a limited amount may be retained when caught as bycatch in other commercial fisheries. In addition, there is an annual catch limit to maintain a sustainable population size. The vast majority of commercially available red drum are farmed, Texas being the major producer in the U.S. Red drum are raised in coastal ponds but can be raised or finished in tanks. They are very tolerant of a range of salinities and are hardy and well adapted to aquaculture, with the exception of low temperatures. Red drum are carnivorous and do require fish or other animal protein in their diets, but less than salmon or trout. Their diets can be supplemented with agriculture proteins and they are fairly efficient feed converters. There are few reported disease problems. Red drum farms do not discharge water very often and Texas has fairly strict regulations for discharge. Escapes are possible but not a large threat because the farmed fish are derived from native broodstock. Overall, both U.S. wild and farmed red drum are sustainable.